Download the Contractor Saw Pulley Removal & Installation Manual. Replacing the standard pulleys and belt with machined steel pulleys and a “link belt” will make quite a difference in the performance of contractor style saws, on which the motor weight is used to determine the tension on the belt. The following technique describes the steps you need to take to remove the pulleys on what I consider a “standard” contractor saw, where a set screw is loosened to allow you to remove the pulleys. NOTE: On the Delta contractor saw (post 1988) and the DeWALT 746, the arbor pulley requires some special steps for removal, and will be covered later in this article. The original pulleys can sometimes be hard to remove. I’d recommend that you spray the shafts of both the motor and the arbor with a penetrating oil before you try to remove the pulleys. If a pulley sticks as you remove it, you need to be careful as to how you approach the problem. If you pound on the pulley with a hammer, you risk damaging the arbor and/or motor bearings and shafts.. The tool to the left is called a “gear puller”, the easiest way to remove a stuck pulley without damaging the arbor and motor. They are fairly inexpensive, and if you can’t borrow one, are a bargain compared to buying a motor. The fingers of the gear puller are positioned on the back side of the pulley, and the center bolt is pointed to fit into the “dimple” in the end of the shaft. 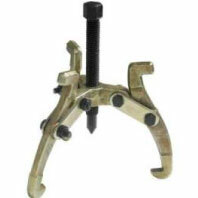 As you tighten the bolt the puller removes the pulley with no strain on the motor or arbor bearings. 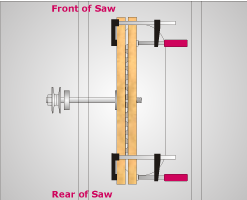 There is normally very little clearance between the pulley and the cabinet of the saw when the blade is square to the top of the saw. 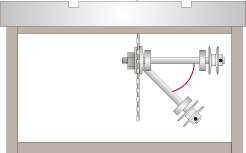 As shown in the drawing to the left, tilting the blade to 45° will give you easier access to the pulley, and room to get the gear puller onto the pulley. Once the pulley is removed, spray penetrating oil on the shafts and clean the shaft(s) with a “Scotch-Brite” type of pad to remove any rust, contamination, or burrs. When installing the pulleys, be sure to install the 2 1/4” O. D. pulley on the arbor, and the 2 1/2” O. D. pulley on the motor. This will give you a 3,833 RPM blade speed (with a 3,450 RPM motor), which is the best “overall” speed we have found. The saw will have ample power for ripping and cross-cutting hardwoods, and a fast enough blade speed to give excellent cuts when cross-cutting plywood and other laminated sheet stock. Where most contractor saws use “slip-on” pulleys, Delta contractors and the DeWALT 746 hybrid take a different approach, as the arbor shaft is threaded on both ends. The arbor shaft is a larger diameter than most contractor saw arbors, and is reduced in diameter to accept a 5/8” bore blade and pulley. 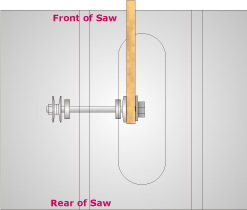 The face of the shaft on the pulley end where the reduction in size takes place serves as a “stop” where the inside face of the pulley will make contact. The standard pulley is a 2 piece pulley, and the “key” is cast into each half of the pulley. The arbor shaft is designed so that both nuts are tightened in as the blade rotates, so the nuts can’t loosen as the saw is used. As a result, you can’t put a wrench on both nuts to loosen the nut that secures the pulley, as both nuts are loosened in the same direction. You need to find a way to stabilize the arbor before removing the pulley nut. One method you may want to try is shown in the drawing to the right. Make 2 pieces of pine about 3” wide, and longer than the throat opening on the saw. The blade should be square to the saw top. Install an old blade on the saw, and tighten to normal pressure. Raise the blade to the height of the pieces, and firmly clamp the saw blade between the wood strips. Go to the rear of the saw, and place a wrench on the nut. Make sure the end of the wrench you will pull on is hanging downward, and give the wrench a quick “tug” toward the rear of the saw to break the nut loose. Install the 1 piece pulley on the arbor, and install the key provided. Install the nut onto the arbor. When you tighten the pulley nut, you should hang the wrench on the nut, and push toward the front of the saw to tighten. If the technique above doesn’t work, the method shown in the 2nd drawing on the right should. Bore a 5/8” hole through one piece of pine. Remove the saw blade, and moisten the area around the hole in the pine with water. Place the piece on the arbor, and install the blade washer and nut. Tighten the nut as you normally would for using a blade. Rotate the piece to make contact with front of the throat opening. Use the same technique to loosen the nut as described above.